"Your questions reveal that your priorities are not in sync with those of SkipTheDishes." A young woman in Winnipeg had her second job interview with a company abruptly cancelled because she asked about wages and benefits for the position. 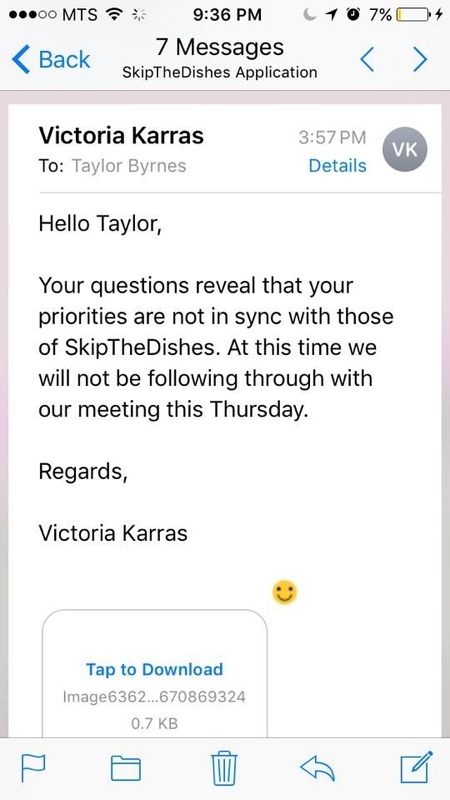 Taylor Byrnes tweeted that she was interviewing for a menu development job with the food delivery service SkipTheDishes. After an initial phone interview, Byrnes asked what wage and benefits came with the position, at which point the HR person she was dealing with told her the second interview would be cancelled. "Your questions reveal that your priorities are not in sync with those of SkipTheDishes," Byrnes was told, according to emails she shared on Twitter. In a follow-up email, Byrnes was told that the company believes "in hard work and perseverance" as opposed to "focusing on compensation," and that she would likely not be a good fit because she was asking about money too early in the process. "Our company culture may be unique in this way, but it is paramount that staff display intrinsic motivation and are proven self-starters," the email said. Byrnes' tweet, in which she called for a boycott of SkipTheDishes, was shared thousands of times. BuzzFeed Canada reached out to Byrnes for comment. People still work in return for money, right? SkipTheDishes says it has since reached out to Byrnes to apologize and to offer her that second job interview. 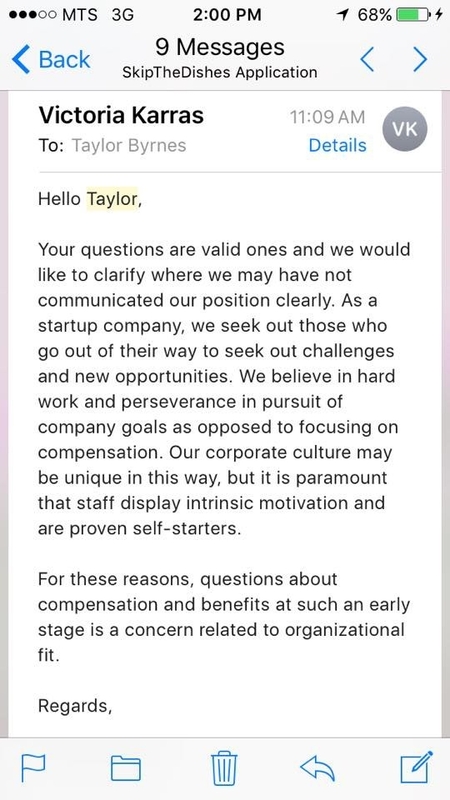 “The email sent to Taylor was wrong and does not represent our team’s approach or values," co-founder Joshua Simair said in a statement shared with BuzzFeed Canada. "We are very disappointed in how it was handled. We do share a compensation package prior to hiring. As soon as we became aware of it on Monday, we reached out to Taylor to apologize for the email and reschedule her interview." Simair also said the company will provide staff with more training to avoid similar situations in the future. SkipTheDishes was founded in Saskatoon in 2013 and is headquartered in Winnipeg. Its food ordering service is available in cities across North America. In 2016, it was bought by its larger rival Just Eat for $110 million.